There’s something exciting about opening a brand-new box of crayons. Today’s Crayola crayons come in 152 colors, but the first box contained only 8 colors. A box of crayons cost a nickel back then and children were happy to have 8 colors, since previous crayons came only in black. Alice Binney, a school teacher, asked her husband to consider making a crayon to replace expensive European crayons. Edwin Binney got to work with his partner, Howard Smith, and came up with the modern crayon. In 1903, their company, Crayola, was born. Today Crayola sells over billion crayons each year. For generations, children had used chalk to write their schoolwork on small slates. Before that, children might use bits of charcoal or ashes. 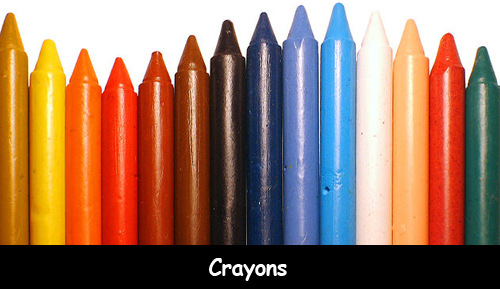 In Europe, the first crayons were made from oil and charcoal. They were black and were not safe for children. Binney and Smith’s company, started by Binney’s father, originally made lamp black, a pigment created from the soot of burnt oil. The company was called Peekskill Chemical Works. When Binney and Smith took over, they started making pencils and chalk for schools. Instead of making crayons from oil and charcoal, they made crayons from paraffin wax and nontoxic colored pigments. Question: How do Crayola crayons get their funny names? Answer: Workers at Crayola often start by looking in the dictionary for ideas. Crayons are often named after traditional artists’ paints. And sometimes, Crayola asks the public for ideas. Visit the Crayola crayon factory. Declan, Tobin. " Who Invented Crayons? Easy Science for Kids ." Easy Science for Kids, Apr 2019. Web. 18 Apr 2019. < https://easyscienceforkids.com/crayons/ >.